Just weeks before Pat Farmer was scheduled to depart for a 20,919-kilometer run from the North to the South Pole, his major sponsor pulled out and he was faced with a choice: give up his dream to be the first man to run Pole-to-Pole or sell everything he owned to finance the expedition. Farmer, a 51-year-old Aussie who jokes he’s been having mid-life crises since he ran his first ultra-marathon at age 18, decided to sell almost everything he owned – his house, his furniture, and most of his worldly possessions – in order to take a shot at his dream. And then he ran. Farmer completed his Pole-to-Pole run in 10 months, averaging about 40 kilometers per day or 46 marathons a month, running through blistering heat, freezing cold and the impenetrable Darien Jungle. Along the way, he raised A$100,000 for Red Cross International. Now back in Australia a year after completing the run, Farmer is trying to get back on his feet financially, but says he has no regrets. Farmer has been testing the limits of ultra-running for decades. Four years after his wife died unexpectedly at 30, leaving him to raise their two small children on his own, he ran around Australia and the resulting notoriety catapulted him into Australia’s parliament. But after nine years in politics, he got that familiar itch, the call to get back on the road. We caught up with Farmer via Skype recently and, now back in Australia a year after completing the Pole-to-Pole run, and fresh off a run across the length of Vietnam, he is trying to get back on his feet financially. But says he has no regrets and continues to try to live memorably to justify why he’s alive and his wife is not. What did you do before you became a Parliamentarian? I was a professional runner. I’ve been an ultra-marathon runner since I was 18. In between that, I’ve done other things to make ends meet. So how did you make the transition from athlete to Member of Parliament? I left school when I was just 14, and worked as a mechanic in a garage near the route of a big race here in Australia, the Sydney to Melbourne ultra-marathon, which was made famous by Cliff Young, who won the race at the age of 63. It’s a 1,000-kilometer race. He went without sleep and won the race. Cliff became a folk hero here in Australia and I remember thinking to myself at the time, ‘I wish I could be something more than just a mechanic. I want to make something out of my life.’ With that in mind, I tried to qualify for the race. I tried and failed a few times but I finally qualified – it took me three years – and I competed in that race four times. Then in 1991, when I was 22, I went to America and ran from Huntington Beach, California, to Central Park in New York in the Trans-America Footrace. I finished second. It took 54 days to cross the States. Were you making a living from running? I made some money from endorsements and there was a little prize money, but not much. I completed in other races all around the world. I was asked to do a run around Australia in 2001 with the idea that I would link together all the states and territories of Australia with my footsteps – putting one foot in front of another to show Australians that this is a huge country, but if one man can link it together, imagine what we could all do if we worked together. I did that, it was 14,964 kilometers, and it took six months and 19 days. I got wonderful support and got a huge reception on the steps of Parliament in Canberra. I took the opportunity and moved into politics. I became a Junior Minister for Education, Science and Training, a Shadow Minister for Sport & Youth, and I held those positions for about 9 years while I was in politics. Then I got out of it and did the Pole-to-Pole Run. You quit politics to do the run? When I ran around Australia, I was originally planning to do a run starting in England and going to all the countries where most immigrants moved to Australia from. As it turned out, it was too expensive. But the whole time I was in politics I felt like I had some unfinished business with my running. That’s what prompted me to kick off the Pole-to-Pole run; to do something that no one had ever done before. I was married but my wife died when my kids were very little. My son, Dylan, was 10 months old, and my daughter, Brooke, was 2 years old at the time. My wife had Mitral Valve Prolapse, which meant that the valve in her heart just popped out one day and she died completely out of the blue at age 30. So I raised my two children on my own since that time and still do. My daughter is 18 now and is at the university. My son, Dylan, is in high school. But the whole country has gotten to know my children because I’ve dragged them all over the world competing in races. So they stayed in Australia while you ran Pole-to-Pole? They did, but Women’s Weekly, one of our magazines here, flew Dylan out to meet me after I came off the ice on the North Pole and touched Canadian soil on Ward Hunt Island. It was a surprise; he came off a plane and wrapped his arms around me. It was quite an emotional moment. Has anyone else attempted to run Pole-to-Pole? No. There aren’t many challenges left in this world where you can be the first. It was a matter of taking on the longest possible run I could. People have run across the equator, but they are more or less island hopping – not running continuously. I wanted to run every day. So I had to get on a plane and fly from Ushuaia at the bottom of South America to the South Pole region, but it was only a five-hour flight and I got off the plane and started running. How much did it cost to finance this expedition? It was about $2.4 million dollars, most of that financed by myself. One of my sponsors pulled out at the last moment. I was supposed to go from the South Pole to the North Pole and I had about 15 months to do it, so I felt it was quite achievable. When my sponsor pulled out, I’d already paid deposits for the Russians to fly me into the South and North Poles and I’d already paid for a lot of crew support, so I had to decide whether to ditch the whole thing or try again the next year. I felt like if I don’t do it now, I’ll never do it. I ran out of time to do the South Pole first, because you have a short weather window for that. So I had to reverse it and start with the North Pole and complete the whole thing in only ten months. It was a race against time to make it to the South Pole. I found one major sponsor – Channel 9 here in Australia and some minor sponsors, but I was still short by a lot of money. I sold my house in Sydney, sold my furniture, paintings, everything I had. My children were in boarding school, so that was fine. We rented a unit so that my children would have a base to go to on the weekends and I sunk the rest of the money into the run. I sold most of my belongings so I had to start from scratch again when I got home. Did people say you were crazy? It’s gone beyond the crazy stage. It’s this burning desire to get back to basics. To move away from the computer and out of the office; to experience life and walk the path that no one has walked before. Guys will go through a mid-life crisis. They use to buy red Porsche but now it’s different. They’re looking for more from life. So people get into these adventures – they want to climb mountains, or hike in exotic locations or go trekking through jungles or forests or run in ultra-marathons. For guys, in particular, it’s a burning desire to rediscover themselves and prove to the world that they’re not done living yet. So was your Pole Run the result of a mid-life crisis or not? For me, I’ve been like this since I was 18, so I suppose I’ve been having mid-life crises since I was a teenager! The fact that I’m still on this planet makes me feel that I have a destiny to fulfill. I don’t know what that destiny is, but every time an opportunity presents itself, I figure, maybe this is what I’m supposed to do with my life. So I accept the challenge and then go off and do it. Life is full of adventure and bends in the road – you either take them or you live on regrets. Stage 1 of your expedition was a 760-kilometer trek across the ice of the Arctic. How does one get to the North Pole? The Russians are the experts at taking people into the Arctic and the Antarctic. If you have enough money, you can buy half the Russian army. I flew from Australia to New York. I trained in New York dragging tires around Central Park for six weeks. I needed to get used to dragging a sled in the Arctic, so I would drag my truck tires from the apartment I was staying in on 118th Street in Harlem down through Central Park, and I would do four laps around the park each day. That’s just under a marathon. From New York, I flew to California where I picked up my support vehicles – two Winnebago vans – met my crew and we drove up to Vancouver. From there, we flew up to Norway and drove up to Longyearbyen, a tiny island, north of Norway that Norwegians go to for holidays. There are polar bears and a little village that looks like something out of a Hans Christian Anderson novel. From there, they flew me in a Russian truck carrier plane into the Arctic Circle, where they have a base. We landed on an airstrip about 160 miles from the North Pole itself, and from there we went by helicopter to the North Pole itself and that’s where we started the expedition. There were four of us on this phase of the expedition. We all had to drag our own sleds, set up our tents each night and so on. The sleds had our food, our tents, our spare clothing and fuel from our burners, rifles, in case we came across polar bears, and our ice axes and boots and snowshoes. It was a 40-day trek across the Arctic? What was a typical day like? It was 39 days from the North Pole to the Canadian shoreline. A typical day we would be on the ice for 12 hours per day. The temperatures got down to about minus 40. We had 100-kilometer winds, total whiteouts. Often there were days when you couldn’t see which way was up, which way was down and the snow was blowing right in our faces. The Arctic Circle is like an ice cube that floats on the ocean. If you get a warm current that comes through, the ice cracks, so you have to decide to jump across, as the ice cracks apart, or you’re left stranded on one side and you have to put on a dry suit, zip it up, grab two ice axes and tie a Kevlar rope around your waist and swim to the other side. And you have to drag your sled across. The sled is like a cut down plastic kayak. How cold was it in the tent at night? It’s 24 hours of daylight so it’s hard to sleep. I’d go to sleep with my clothing still covered in ice. There was no way I could get it all off; it’s too cold. The only bit of comfort was inside my sleeping bag, and that was only after about an hour of being in there when you start to warm up again. It was miserable. There is nothing more horrendous than the North Pole region. The South Pole was a piece of cake by comparison. The South Pole is a solid mass of land with snow and ice on top of it. It gets cold down there but you don’t have to worry about Polar bears or falling through the ice. Did you run throughout this expedition or did you walk at times? In the South Pole, I put on my Baffin boots and just ran. In the North Pole, I had those on, plus snowshoes. So it took you 39 days to make it to Ward Hunt Island in Canada and then you were airlifted to Radisson, Quebec, where there’s a road? That’s correct. It’s the northernmost road on the eastern side of Canada. We ended up running through 14 countries from there. Canada, the U.S., Mexico, Guatemala, El Salvador, Honduras, Nicaragua, Costa Rica, Panama, through the Darien Gap, Colombia, Ecuador, Peru, Chile and Argentina. Stage 2 was an 11,744-kilometer road run through North and Central America and then Stage 3 of your expedition was a 250-kilometer trek through the Darien Jungle? How long did that take? It took five days. I had 14-armed soldiers from Colombia and Panama assigned to me. Has anyone run through the Darien Jungle before? No. It’s a dangerous place. My crew wasn’t allowed in. The soldiers had machine guns and sniper rifles. We bushwhacked our way through it with machetes. There are a lot of drug runners holed up there. It’s a trade route to smuggle drugs up through Central America and into the United States. When we got to Colombia, some of the soldiers broke down in tears. They were really moved by the experience we had, and it highlighted for me what we achieved on the run. It wasn’t just about one person running. It was about changing people’s attitudes toward life itself. It was about inspiring people to see what they could do with their own lives. I had people travel long distances just to run with me for half a day or sometimes less. I met people who traveled long distances just to share part of my run with me, for maybe 10 or 20 miles. After you made it through the jungle, you ran 9,693 kilometers through South America. How did that leg compare to the North America leg of your run? North America was a Godsend. In the Arctic Circle, I was surviving on olive oil, butter and dry noodles for the most part. Our food intake was minimal because we could only take what we could carry. I weighed 65 kg (143 lbs.) but dropped to 49 kg (108 lbs) by the time we got to Canada. I was nothing but skin and bones. But there was plenty of good food and shops all through North America, and I had my support crew, so instead of sleeping on the ice, I was sleeping in the Winnebago. In South America, there were longer distances where we weren’t close to stores and places to eat. Did you take any days off on this run? No. I read about people who ran around the world but took breaks to go home or nurse injuries and I just didn’t think that wasn’t the same challenge. The challenge is you start something and you don’t stop until you finish. And I couldn’t take breaks because it was a race against time. There is only a certain window of opportunity to get to the South Pole and once you lose that, no one will fly you down there. I was on tenterhooks the whole run. Because what’s the point of starting something like this if you can’t finish it? There was one day in Mexico where I ran 140 kilometers in a 24-hour period. I ran about 90 kilometers a day all through Colombia to try to make up some time. How many kilometers did you average per day? The average was 65 kilometers per day with no days off. I covered 20,900 kilometers. It was much higher than that on the mainland but the North Pole pulled the averages back. We had one day in the North Pole when Jose, my cameraman, fell through the ice and we only did 5 kilometers for the day and he nearly died but managed to recover. How did your body hold up on the run? My feet weren’t too bad. My fingers ached continuously at the poles; they were so cold they felt like they were on fire. I thought for sure I would lose some fingers, but I survived. What was the weather like at the South Pole? It was minus 30, minus 35 and we had a few days with whiteouts, but I did that leg – 900 kilometers – in just 20 days. It was much easier than the North Pole because it’s solid ground underneath the ice, and I didn’t have to drag a sled. My support crew was on Skidoos. How did you know when you’d reached the South Pole and what did you do when you got there? There’s two things down there: the geographical South Pole, which changes slightly every few years and the old barber shop South Pole set up by the early explorers. It’s a little village. Unlike the North Pole, there are some buildings. It’s more stable than the North Pole, which is moving all the time. There’s a U.S. science base at the South Pole and a lot of the scientists were following my journey so they came out to cheer me on at the finish. There are some researchers living there and when I was there, there were about 20 explorers there as well. What did you do the night you finished the expedition? I slept for starters. My hands were swollen very badly, so I had to see a nurse there. They took my gloves and boots off and immersed them in some hot water to bring down the swelling. I ate some decent food, which was a relief after eating rations for so long. So you came back to Australia and had no home. You had to start fresh? Yes. I’m renting a small home at the moment. I’m gradually trying to get back on my feet financially, but it’s taking a while to get back to where we were. But I have no regrets. You can always have a house and a car. But very few people will get to see the places I’ve seen, meet the people I’ve met and change people’s lives like we did during the run. Did the proceeds of the book help to offset your expedition costs? I’m yet to see any royalties from the book. I hope things will come in time. It will be a long time before I can recoup the expenses of the event itself. The North Pole alone costs $500,000; the South Pole was similar, and then there were all the expenses in between. How much of this did you pay for from your own savings? What other challenges do you have in mind? I just recently completed a run through Vietnam. It’s only 3,000 kilometers from the border with China to the tip of the country. It took about six weeks. It was the 40th anniversary of the end of the war. I did that run and was supported by a lot of Vietnamese runners. Other than speaking engagements, what are you doing now? I don’t think I’ll go back into politics, but we have an election coming up here later this year, so I’m helping a few of my former colleagues with that. I want to continue to help Red Cross with their disaster relief projects. For me, it’s not about money; it’s about having a purpose in my life. It’s important for me to look back on my life and see that I did something worthwhile. My wife died when she was too young. Every single day of my life I try to justify why I’m still on this planet and she’s not. I try to make my life count for something. People say to me, “You could make money off of this,” or “You haven’t got any money.” That stuff doesn’t matter to me. So long as I can put a roof over our heads and food on the table, that’s enough. Ski To The South Pole Just Like Prince Harry! Yesterday, we told you that Britain’s Prince Harry is planning on joining an expedition to the South Pole later this year in an effort to raise funds and awareness for the Walking with the Wounded program. The adventurous Prince will take part in a cross-country skiing race that will cover 335 kilometers (208 miles) in approximately 16 days, crossing the final three degrees of latitude before reaching 90°S. This will be a grand adventure to say the least, but did you know that you could go on a similar expedition yourself? That is, provided you are physically fit and have plenty of cash. There are a number of adventure travel companies that offer what is known as a “last degree” journey to the South Pole. Those taking part in such a trip will spend their days skiing across the frozen expanse of the Antarctic Plateau and their nights in a winter camp on the frozen continent. Most itineraries cover about 60 miles in ten days, with the trip culminating with their arrival at the southern-most point on the planet. Participants on a last degree expedition will need to be in excellent shape as they will be skiing over very tough terrain while pulling a sled filled with gear behind them at all times. They’ll also have to be capable of enduring cold weather, unexpected storms and harrowing whiteout conditions, which can arise unexpectedly. This is certainly not a trip for someone who prefers to take it easy on their vacations, as this type of expedition will push travelers to their physical limits.This isn’t a trip for someone with a small bank account either. A last degree journey to the South Pole will set you back approximately $58,000. Yes, you read that right – $58,000. That cost includes transportation to your starting point in Antarctica and a pick-up at the Pole, as well as guides, meals, support staff and everything you’ll need while out on the ice. International airfare to and from Punta Arenas, Chile, the usual starting point for an Antarctic adventure, is not included. If you have the cash and the adventurous spirit required to undertake this type of journey, some of the companies that provide a last degree expedition to the South Pole include Adventure Network International, the Adventure Consultants, Abercrombie & Kent and Alpine Ascents. Personally, I’d love to do this trip, but unfortunately I only have one of the two requirements. Can you guess which one? We’ve known for sometime that Britain’s Prince Harry has an adventurous streak in him, and I’m not just talking about those questionable photos that emerged from his now infamous trip to Las Vegas last year. In April of 2011, he joined an expedition that skied to the North Pole, although he was forced to depart early in order to be home in time for his brother’s impending wedding. Last week it was announced that the Prince will once again set off for the colder regions of the planet as he now intends to join one of three teams that will be racing to the South Pole. Dubbed the South Pole Allied Challenge 2013, this race will pit three teams against one another on a 335-kilometer (208-mile) journey that will cross the final three degrees of latitude to the Pole. Those teams will include a group from the U.K., another from the U.S. and a third combined squad from the Commonwealth nations of Australia and Canada. Each team will attempt to be the first to ski to the South Pole while battling high winds, whiteout conditions and temperatures that are expected to routinely fall below -30°F. As with his previous arctic endeavor from a couple of years back, Harry’s new expedition is also taking place in conjunction with the Walking with the Wounded foundation. That organization was created to support men and women who have been injured in the line of duty while serving their country. The Walking with the Wounded program helps those soldiers to prepare for a return to civilian life after their tour of duty has ended. Harry has taken a particular interest in the program and has served as its patron for several years. The teams racing in the Allied Challenge will largely be made up of soldiers who have recovered from serious injury. The teams will all gather in Antarctica in late November and begin the race shortly there after. It is expected to take approximately 16 days for them to reach the finish line at 90°S with the entire Allied Challenge wrapping up sometime around December 17 of this year. Antarctica is our planet’s southernmost continent and home to the South Pole, permanent manned research stations, penguins and an occasional adventure cruise ship expedition. This time of year, a lot of attention traditionally goes to Earth’s North Pole, home of Santa and the gang. But NASA’s DC-8 flying laboratory recently passed over Antarctica’s tallest peak, Mount Vinson, as we see in this photo. On October 22, 2012, during a flight over the continent to measure changes in the massive ice sheet and sea ice, NASA captured this image as part of its ongoing program.NASA’s Airborne Science Program at the University of North Dakota manages operations of NASA’s DC-8 Airborne Science Laboratory aircraft, which collects data for the world’s scientific community. The DC-8 flies three primary missions: sensor development, satellite sensor verification and basic research studies of the Earth’s surface and atmosphere. 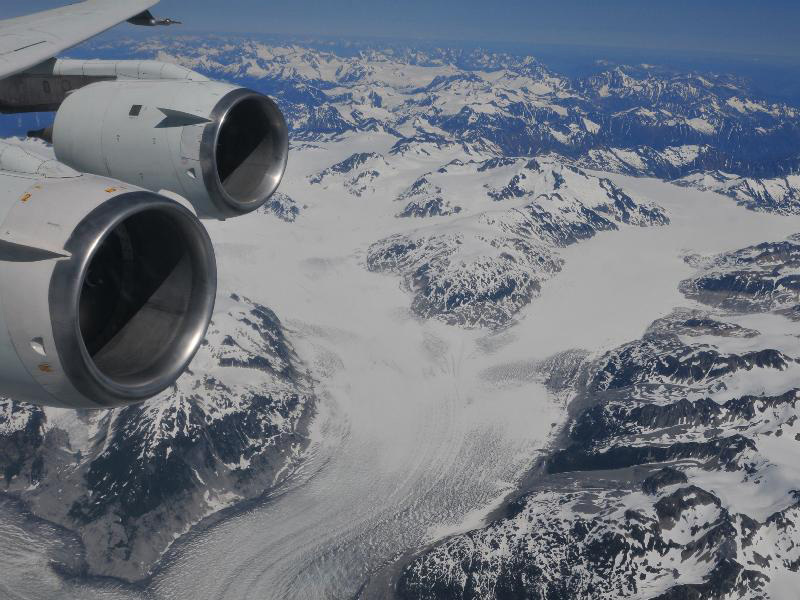 Operation IceBridge is a multi-year airborne campaign to watch changes in the Earth’s polar ice caps in both the Antarctic and Arctic. Mount Vinson is located in the Sentinel Range of the Ellsworth Mountains in Antarctica. The North and South poles are the two points where the Earth’s axis of rotation intersects with its surface. While the South pole actually exists in a physical place on Antarctica, the North Pole is really in the middle of the Arctic Ocean in waters covered with sea ice almost year-round … except for around Christmas time when Santa, Mrs. Claus, the reindeer and elves are busy with the holidays. NASA has tried repeatedly to photograph Santa’s home but cannot come up with more than an image of ice and snow. “NASA’s Terra satellite was able to piece together a number of images it took to give us a complete look at the North Pole, which is usually very difficult to see by satellites, so Santa can keep his exact location secret,” says NASA captioning this Flickr photo. Have you ever wondered how travelers to Antarctica get to and from the continent? I’m not talking about the thousands of tourists that go aboard a cruise ship each year. I’m referring to the explorers who ski to the South Pole or the research scientists who spend weeks studying the impact of climate change on the frozen continent. Most of them charter a flight aboard a plane operated by a company called Antarctic Logistics & Expeditions, who shuttle their clients from Punta Arenas, Chile, to a permanent base at Union Glacier. As you can imagine, those who make the trip tend to bring along quite a bit of gear, so a large plane is needed for the flight. ALE uses Russian Ilyushin IL76 aircraft, which are landed on a runway made out of ice. The video below is an example of such a landing and gives you an idea just how large these aircraft are.